Geometry Gym provides tools for architects and engineers, streamlining work flow processes for improved productivity and designs. 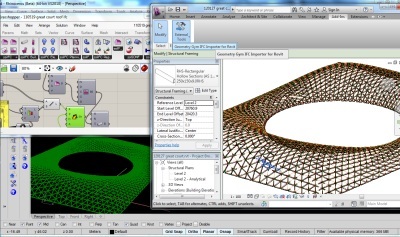 Powerful Parametric and Generative modeling of structure is enabled by using plug-ins for Grasshopper and Rhino. Development is progressing for BIM model generation, manipulation and exchange using neutral formats such as IFC and CIS/2, particularly for projects that aren't flat and orthogonal. Computational Geometry commands and functions (also useful to designers in industries other than archicture) are also provided in the plug-in StructDrawRhino. Tessellation (polygon packing), geodesic domes, mesh relaxation, minimal surfaces, and others are included. And you'll find worked examples of these used in architecture for projects such as the Beijing Water Cube or British Museum Great Court roof on the Geometry Gym Blog.